Tsogo Sun Hotels are renowned for comfort, intuitive service, and characteristic African warmth. At over 100 hotels – from Budget, to Select Service to Full Service to Luxury – our guests are welcomed with warmth and cared for with attention to the little details that count. Come and write your story with Tsogo Sun Hotels’ wide range of quality hotels. From the moment you enter the Tsogo Sun Hotels world you will experience variety and uncompromising quality. Our proud portfolio of brands includes Sun1 in the Budget category; SunSquare, Garden Court, and StayEasy in the Select Service category; Southern Sun Hotels and Southern Sun Resorts in the Full Service category; and properties such as the iconic Beverly Hills in uMhlanga and 54 on Bath in Rosebank in the Luxury category. Each hotel within the deluxe portfolio is individually branded and operated according to its own personality, derived from its location, design and community environment. These luxury hotels are typically graded as 5-star hotels and are some of the most iconic properties in their area including the Sandton Sun at Sandton City, the Palazzo at Montecasino, the Beverly Hills in Umhlanga and 54 on Bath in Rosebank. Maia in the Seychelles is undoubtedly one of the best hotels on the Islands, if not the world, offering 30 villas on a private peninsula on the Island of Mahe, with unparalleled service and the hotel’s unique “beyond all inclusive” offering. The group also operates two Intercontinental branded hotels in Johannesburg under licençe from the InterContinental Hotels Group plc (“IHG”). This is the Tsogo Sun Hotel Group’s core, full-service brand and is typically graded as 4-star when applicable. The majority of these hotels are located in key urban nodes, servicing business and leisure travellers alike. The properties have substantial food and beverage operations as well as conference facilities. Resort properties are located in attractive tourist areas such as Umhlanga, Plettenberg Bay, the Drakensberg and Mpumalanga and includes a large Timeshare operation. In addition, the group operates the beautiful Paradise Sun on the Island of Praslin in the Seychelles. The group also operates the Crown Plaza in Rosebank and Holiday Inn Sandton properties that would fall within the Southern Sun category of branding. The Select Service category offers self-sufficient travellers a good level of comfort, with contemporary, urban hotels in convenient locations at great rates. Warm, effective service, a great night’s sleep and multi-functional spaces to work or relax in a comfortable, welcoming environment are the hallmarks of our SunSquare, Garden Court and StayEasy offering. SunSquare – is the alternative and trendy offering to the mid-scale market. These hotels offer great locations, with properties opened at Montecasino, Suncoast, in the Cape Town City Bowl and in Gardens, as well as creative, well priced food and beverage operations through in-house concepts such as Jeera, Vigour & Verve and Zepi. Garden Court – is a well-established and successful mid-market offering, spanning 20 hotels with some 3,700 rooms. This brand includes large well-known hotels such as the Garden Court Marine Parade and Garden Court Sandton City, which have both undergone a complete refurbishment in recent years through to smaller properties such as the Garden Court Newcastle, which has recently been expanded by a further 40 rooms. 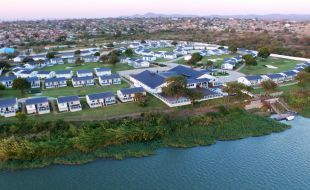 The Garden Court Kitwe in Zambia was opened in 2018 and represents the first Garden Court outside of South Africa. StayEasy – Catering to the economy or budget segment this brand has grown to 10 properties with some 1,500 rooms. Offering great value and tasteful rooms, these hotels have been developed in key business locations such as Century City and the City Bowl in Cape Town, Eastgate, Pietermaritzburg and Pretoria. StayEasy has products outside of South Africa with hotels in Lusaka, Zambia and Maputo, Mozambique. The Maputo hotel is the latest build, opening in 2018. SUN1 – consists of the portfolio of budget hotels acquired from Accor, and originally built as Formula 1 hotels in South Africa. This portfolio has undergone a substantial refurbishment in most of the properties post the acquisition and consists of 22 hotels situated country-wide. SUN1 offers well-appointed rooms sleeping up to three guests at a great price. The SUN1 Southgate was recently expanded and in now the largest in this portfolio at 138 rooms.